We at Novalis offer our congratulations to the Sisters of Service as they celebrate their 90th anniversary this year. This evening the Sisters of Service are hosting a book launch celebrating the life of their founder, Catherine Donnelly. 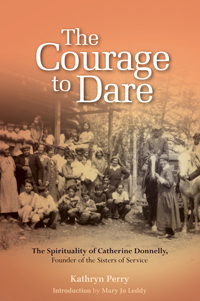 Novalis recently released The Courage to Dare: The Spirituality of Catherine Donnelly, Founder of the Sisters of Service by Kathryn Perry. Join the author, and many of the sisters, at Regis College in Toronto this evening as they celebrate the life and contribution of their founder, and community, to the Church in Canada. -From The Courage to Dare: The Spirituality of Catherine Donnelly, Founder of the Sisters of Service by Kathryn Perry. © 2013 Novalis Publishing Inc.